Join us in DC to Commemorate the 75th Anniversary of D-Day in 2019! 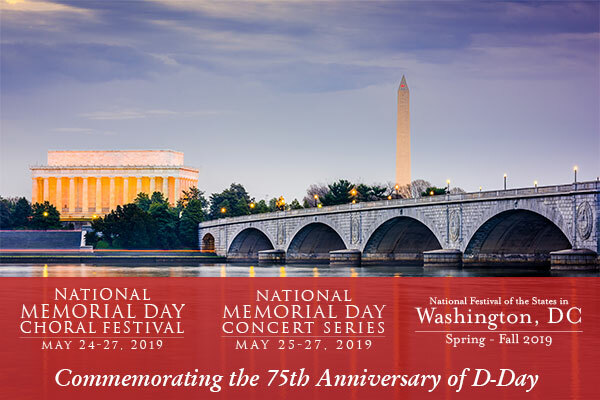 In commemoration of this important holiday, Music Celebrations International, the American Veterans Center, and the United States Air Force, are pleased to sponsor and produce a unique Musical Tribute in our Nation’s Capital that honors veterans past and present who have sacrificed so much for the liberties we enjoy in our country. The setting for this commemoration is historically the Concert Hall at the John F. Kennedy Center for the Performing Arts. Music Celebrations International and the American Veterans Center are pleased to present the sixth-annual National Memorial Day Concert Series. Performances will take place throughout Memorial Day Weekend at the National World War II Memorial, the Thomas Jefferson Memorial, the Abraham Lincoln Memorial, and the United States Air Force and Navy Memorials. Performance slots and requests are given on a first-come, first-serve basis.Other performance opportunities may be available upon request. The National Festival of the States is an annual concert series developed by Music Celebrations in various cities throughout the United States. These performance tours are supported by local government offices, community organizations, tourist boards, and the like. Such affiliations offer a more memorable musical, cultural and educational experience for recommended ensembles (both instrumental and vocal) to perform in different venues in the most historic cities and celebrate the founding, history, and institutions of the United States! For more information on any of these events, please contact info@musiccelebrations.com.